After Monday's furious selloff which saw a relentless barrage of heavy sell programs as one or more hedge funds threw in the towel and liquidated at any price, Tuesday has seen global markets and US equity futures stage a modest rebound while shares in Europe pared a drop following a weak session in Asia after Xi Jinping failed to impress traders with any new stimulus measures during his much anticipated speech. 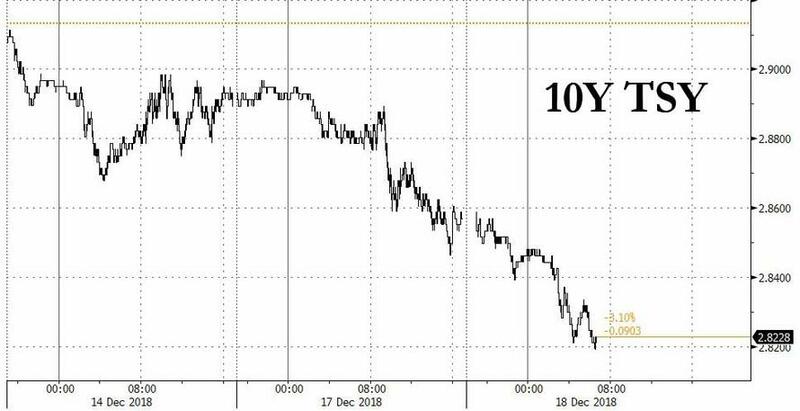 The dollar tumbled, oil flash crashed while Treasuries, gold and the yen advanced as neurotic traders peeked from under their bomb shelters. Starting the session's main event, Chinese President Xi Jinping failed to offer any fresh commitments to open or stimulate the world’s second-biggest economy in a keynote speech. 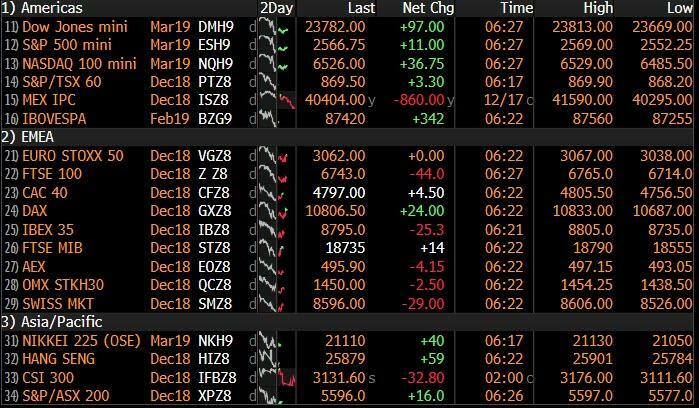 That compounded the gloom surrounding riskier assets, and sent Chinese equities lower while both the MSCI Asia Pacific and MSCI Emerging Market indexes retreated (for more details see our recap here). In a speech marking 40 years of market liberalization, Xi called on Tuesday for the unswerving implementation of reforms on Beijing’s terms, saying no one could boss it around. In remarks lasting nearly an hour-and-a-half, Xi called for support for the state economy and development of the private sector, and said China would expand efforts at opening up and ensure the implementation of major reforms. 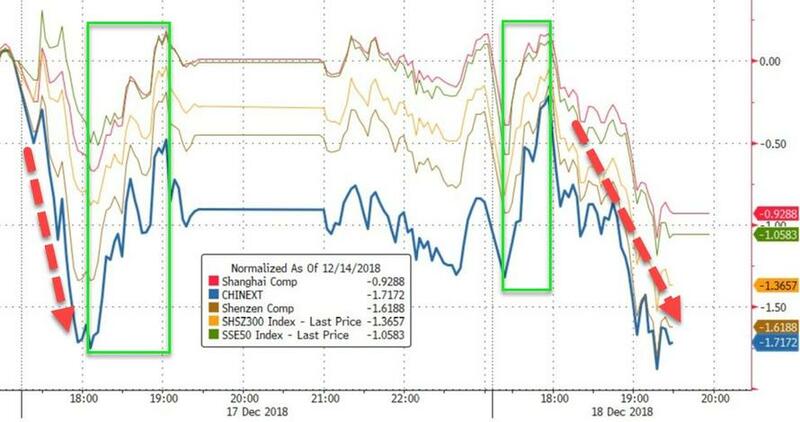 But the one thing that traders were looking for was missing, as Xi offered no new measures, resulting in more early session selling. Europe's Stoxx 600 Index initially followed Asia lower, but recovered most of its losses as the session progressed. Futures for the S&P 500 Index showed a rebound after the underlying gauge plunged to the lowest in 14 months on Monday. Even with the reversal in sentiment, the S&P 500 is almost 8% lower in December - heading for its worst month since 2010. 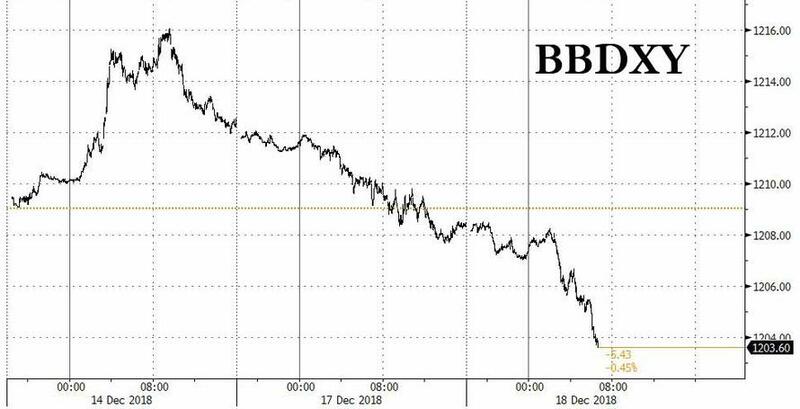 The risk-on tone returned after the dollar suddenly tumbled, starting a steep decline shortly after 2am ET, which dragged the Bloomberg Dollar Index lower for a second day before the Fed begins a two-day policy meeting. As the dollar extended its slump, Treasuries advanced as traders positioned for the Fed’s policy decision, with yields on 10Y TSYs dropping as much as 3.6bps to 2.82%, the lowest level since Aug 27. Germany’s 10-year bond yield fell to a one-week low of 0.23 percent. 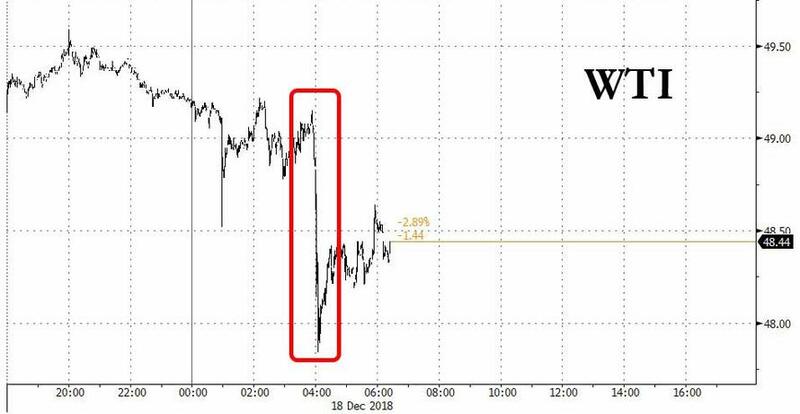 Perhaps the most notable overnight move was in the commodities market, where one day after WTI dropped below $50 for the first time since July 2017, oil flash crashed shortly after Europe opened for trading, plunging as much as $1.50 with no obvious driver. The sharp price drop followed reports from the US that their shale oil output is to top 8mln BPD by year end. There have also been comments from Russian Energy Minister Novak who states that December output is around Octobers levels which are slightly higher than in November; meaning that Russia’s output has increased not decreased following the OPEC+ deal where they pledged a cut of 228,000 BPD. Later today we have API Weekly Stocks which are expected to present a 3.25MMbbls draw, which may offer prices some respite from the current downward pressure. Gold has benefited from dollar weakness reaching week highs of USD 1249.83/oz ahead of this week’s FOMC meeting. While Palladium has fallen from the record high of USD 1269.5/oz reached in the previous session. Elsewhere Chinese steel and raw materials have fallen alongside the broader risk sentiment and after President Xi’s speech where no new specific reform measures were stated. 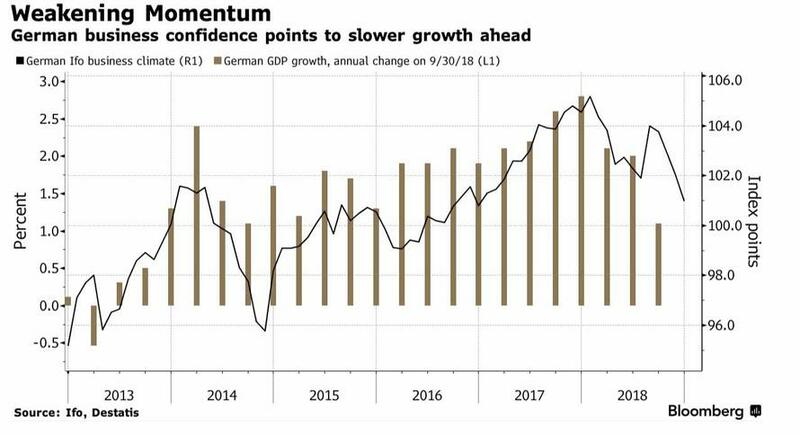 Elsewhere in FX, on a weak-dollar day, the euro rose shrugging off the IFO survey showing that German business sentiment deteriorated further to its lowest level in more than two years. While sentiment reversed from yesterday's apocalyptic mood, there still seems little that can halt the sell-off in equities so investors are increasingly pinning their hopes on the Fed taking a dovish turn this week. MSCI’s world stock index has fallen 10 percent this year and is set for its worst year in a decade. While a rate hike is widely expected, we noted earlier why a rate hike tomorrow is looking increasingly iffy. President Donald Trump has ramped up his criticism of policy makers, tweeting that “it is incredible” the Fed was even considering another rate rise and on Tuesday morning Trump said he hopes "the people over at the Fed will read today’s Wall Street Journal Editorial before they make yet another mistake". It's not just the Fed that poses a last minute hurdle, with more potential trouble looming: on Friday, the same day as quad witching, the US government will likely shut down unless Trump and Schumer find a last minute compromise. For now that looks unlikely. 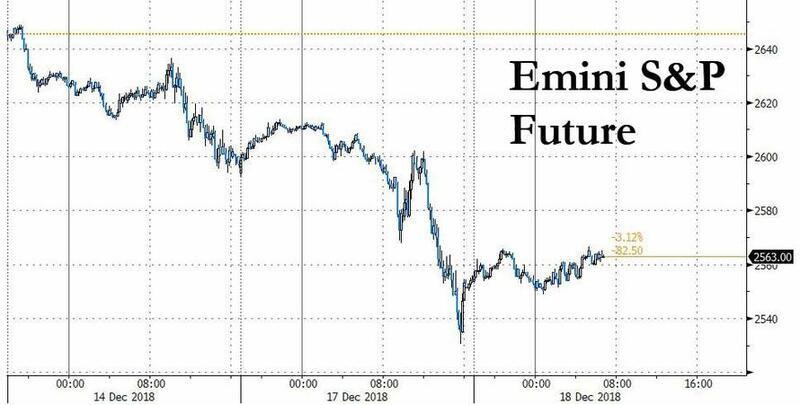 “Any news is being taken as bad,” regardless of the context, said Evan Lucas, chief market strategist at Investsmart Group, on Bloomberg Television. "We are trading like we’re in a bear market, with little likelihood of relief in volume-thinned markets in the holiday period ahead," he said. regarding trade developments with the US. Chinese President Xi said China is to stick to supply side reforms, to promote trade convenience and a multilateral trading system. President Xi added that no-one is in a position to dictate what China should or shouldn't do and opposes nations forcing their ideas on others and that China may face unimaginable difficulties ahead, but will control major risks in the economy. In FX, the JPY was the best G10 performer and beneficiary of safe-haven positioning amidst broad risk-aversion in global equities and especially oil that continues to price in a return to oversupply vs demand. Consequently, Usd/Jpy has pulled back further from recent highs to retest December lows not far above 112.00, but may encounter some technical bids around 112.40 (100 DMA) given decent option expiries in the same area (1 bn from 112.40 to 112.55). GBP/AUD/EUR - All firmer vs the Greenback, as the DXY skirts nearest sub-97.000 chart support at 96.850, and the Buck’s defensive pre-Fed tone overshadows independent factors that may otherwise keep the Pound, Aussie Dollar and single currency suppressed. For Sterling, Brexit remains the obvious and main stumbling block, but Cable is sitting more comfortably above 1.2600 and testing the 10 DMA at 1.2640, while Aud/Usd is staging another attempt to breach 0.7200 even though the Aud/Nzd cross has recoiled sharply to sub-1.0500 levels on the aforementioned Kiwi outperformance. Eur/Usd has also established a firmer base above a big figure, at 1.1300, and eyeing strong chart resistance at the foot of a daily formation just before a cluster of other upside targets around 1.1400 where a decent 1 bn expiry runs off. However, more downbeat German macro news in the form of December’s Ifo survey has also dampened some of the Euro’s more bullish momentum. CAD/CHF - The Loonie is struggling to bounce off 1.3400+ lows given the latest collapse in crude prices, which is also undermining the likes of the NOK despite March 2019 Norges Bank rate hike guidance from Governor Olsen, while the Franc continues to meet offers ahead of the 0.9900 mark and has eased back from peaks vs the Eur towards 1.1300 following more reports of convergence between Italy and the EU on the 2019 budget. In commodities, Brent (-2.3%) and WTI (-2.7%) have continued to decline amidst concerns of an oversupplied market, with WTI dropping to October 2017 levels. The price decline follows reports from the US, the world’s largest oil producer, that their shale oil output is to top 8mln BPD by year end. There have also been comments from Russian Energy Minister Novak who states that December output is around Octobers levels which are slightly higher than in November; meaning that Russia’s output has increased not decreased following the OPEC+ deal where they pledged a cut of 228,000 BPD. Later today we have API Weekly Stocks which are expected to present a 3.25MMbbls draw, which may offer prices some respite from the current downward pressure. Elsewhere, Libya’s NOC has declared a force majeure on operations at the El Sharara oil field, stating that production will only restart after alternative security arrangements are implemented. For context, this follows the force majeure declared on the fields exports last week.